If you have a plane to visit Yiwu for traveling or purchase, where to live may be an important question. Through this essay we’ll give some information of Yiwu Suofeite Hotel, perhaps, the information could be helpful for you. 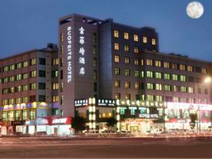 Yiwu Suofeite Hotel is located in the core area of the central business district; it is a close neighbor of. About 5kms from Yiwu China international trade city, you can rent a car from the front desk, which works 24 hours. So it would be very convenient for you to go for purchase in Yiwu market or go to airport and train station. There are 136 rooms with soft light and carpet. You can get lots of nice services here such as free left- luggage office, daily newspaper, laundry service, fax facilities, and breakfast in the morning. If you want to relax yourself after finishing the work, the hotel has snack bar, sauna room. We are sure that you can make yourself at home. You have different choices in the Yiwu hotel. Room styles include single room, luxury room, business room… These rooms are on different prices from CNY238 to CNY558. You can book the suitable room exactly. Selecting Yiwu Suofeite Hotel will give you wonderful experience in China. Do you want any more information? Contact us, your Yiwu agent.